Large Wild Boar wall-mounted sculpture, faux taxidermy, home decor. The model is hollow, lightweight, strong and durable, equipped with keyhole hanger on the back for easy mounting on a wall. Several color options are available including faux bronze or copper using acrylic paints. Our products are covered with UV resistant varnish. You can use our sculpture "as is" or decorate it with acrylic paints. Wild boar is considered one of the most formidable and dangerous forest dwellers from Europe to India and China. The length of the animal is up to 2 m and the weight is up to 200 kg. Meeting with a wild boar in its natural habitat may be very dangerous for a hunter or a tourist. Physical size: 30cm tall, 21.5cm width, 31cm depth. Color: Just select one of color options. "Antique Bronze" (hand painted) option is also available. Thank you for preferring our product. Choosing us, You choose products made by our artists with love, care and attention to detail. 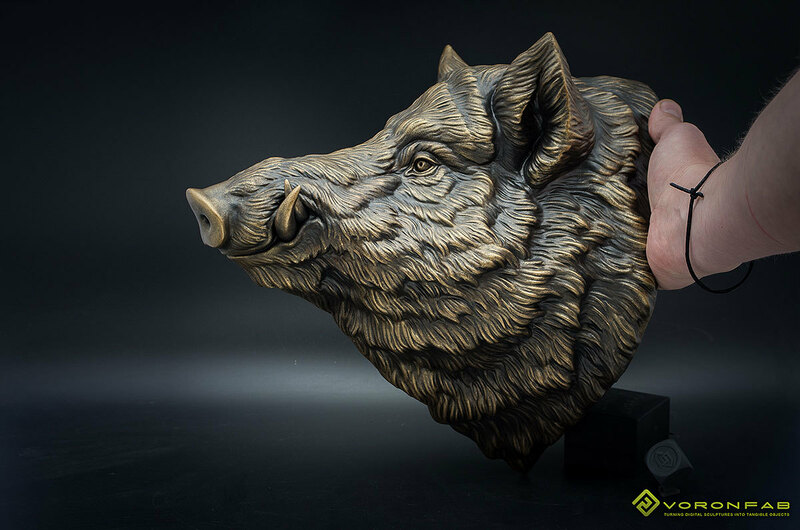 Large bronze boar head looks great! Much appreciated for your workmanship and product! Thank you so much again for the bear skull and bear plaque gifts 🙂 The boar head is bigger than I thought! Everything looks amazing, thank you for the beautiful art! I have received the package and both the wolf and bear skull look amazing! Thanks a lot for the great product and also for the great service. I received my sculpture yesterday. It’s absolutely beautiful. Thank you so much ! Yes, received today my large wild boars, thanks. The size is great. I like the bigger size. We gladly accept returns and exchanges. Contact me within: 5 days of delivery. Ship items back within: 7 days of delivery. We don’t accept cancellations, but please contact us if you have any problems with your order. The following items can’t be returned or exchanged. We can’t accept returns for custom or personalized orders, digital downloads. We do not collect or store your personal data without your consent. Payment occurs through Paypal, you do not disclose any personal information to our site. VoronFab shop never receive your credit card information. You also can register as a buyer to receive notifications on the status of the order. You, the buyer, are responsible for any VAT, tariff, duty, taxes, handling fees, customs clearance charges, etc. required by your country for importing consumer goods. We do not collect this beforehand, and cannot give you an estimate of the cost — charges vary around the world.